This is the year of bunting, it has been everywhere in the shops in the UK, but particularly with the Union Jack on it to celebrate our dear Queen's Diamond Jubilee (what an amazing weekend it was and a fabulous concert outside Buckingham Palace). We also have the Olympics being held in London this summer - the irony is that I will be in the USA for alot of that time. My bunting is to fit in with the Unruly PaperArts botanical theme this month - Buds and Blossoms. I loved making this and the shabby chic style that evolved. 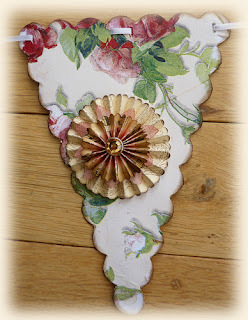 Do pop over to UPA to see the full version of how I made this on my Eclectic Elements column. Have you got something for Tuesday Treasures Blog Hop this week? Enter your special piece that you have been making and join the hop too. Where in the U.S. are you going to be and when? I shall be spending a month there myself later in the year ..... you just know that it wouldn't be anywhere even remotely close though! Forgot to mention how fabbylicious your bunting is though - sorry! A wonderful bunting - just fabulous. Beautiful bunting, Brenda....they look like if they are made of fabric! Beautiful work Brenda, gorgeous colours and I love the way you've embellished the bunting. this is stunning Brenda, what a gorgeous print on the napkins, and love the shabby feel...hugs G.
Absolutely exquisite! You have created a wonderful and elegant decoration for any celebration! 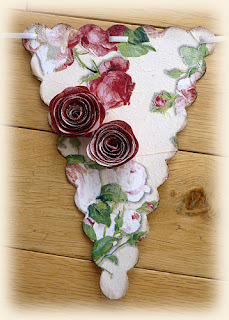 Your Bunting is breathtaking so love this vintage rose design and all the techniques you have use to achieve such stunning work and all your rosettes and roses are beautiful just amazing!!! sorry for being a bad blogger of late, I hope you are well.